From Rosie, the Jetsons’ sometimes cantankerous metallic maid, to the diminutive droid of Star Wars, R2D2, most of us have a mental image of how a robot is supposed to look, perform and behave. If Fabra Elementary fourth grader Brea Hines had preconceived notions about robots before this semester, it just might be that those stereotypes have been transported to a distant galaxy since she met Fred. Fred, the nickname of a robotic devise produced by VGo Communications, spent the month of May in the fourth grade classrooms and corridors at Fabra. Meanwhile, Brea was homebound after being diagnosed with and treated for Wilms tumor, a cancerous tumor of the kidney. Fred became Brea’s way to get back to class and be among her friends. Brea was diagnosed shortly after school began last fall. 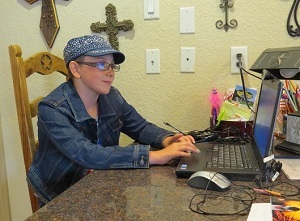 After spending time in the hospital, she was able to return home and eventually resume classwork with the assistance of Becky Collie, Boerne ISD’s teacher for homebound students. Her classroom teacher, Carrie Fiedler, occasionally would be in touch with Brea and her mother, Stephanie, supplying lesson materials and greetings from her classmates. But Brea is the first to admit that “school” did not seem fun, isolated as she was, until late April when a new opportunity presented itself. 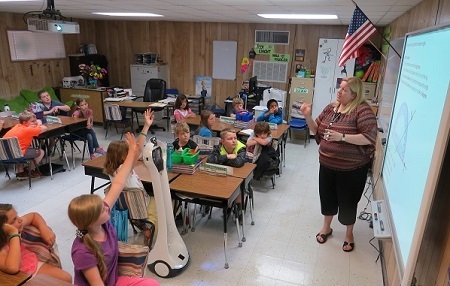 Through a trial program initiated by the Region 20 Educational Service Center, Boerne ISD took the VGo robot on a test drive and all of a sudden Brea was able to be back in her Fabra classroom, albeit virtually. Fred stands about four feet tall, roams about the classroom (or anywhere on campus) on two wheels, and features a video screen and camera that bring Brea into the classroom – and bring the classroom to Brea. 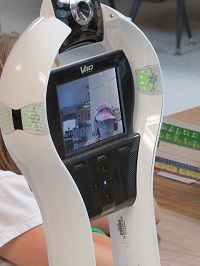 For her part, Brea sits at a laptop computer on a desk in the Hines kitchen, talking on a headset, controlling the VGo’s motions and actions remotely, and engaging once again with her teachers and classmates. Everyone involved agrees with Brea’s assessment. “Before VGo, the time spent interacting with Brea was mostly non-existent,” fourth grade teacher Fiedler says. “I gave work to the homebound teacher and kept in contact with Brea’s mother, but everything felt very distant. Fiedler notes that she has to stay at least one step ahead of Brea, making sure she has handouts and other materials so that she is able to directly follow along during class time. But the teacher says she has seen a marked change in Brea’s attitude since the student regained regular access to her friends. Brea’s mother, Stephanie, agrees that the arrival of the robot has helped Brea close her fourth grade year on a positive note. Even Brea’s classmates have enjoyed the presence of Brea and Fred in their room. “It is like she is actually in the room with us,” says fellow fourth grader McKenna Mann. As she prepares to move to fifth grade, Brea has a couple more treatments in her chemo regimen and then a full physical examination to determine where she is in her fight against disease. And Fred will most likely spend the summer recharging and getting ready to help another child somewhere stay connected with his or her classroom. George Jetson and Hans Solo most assuredly would approve of this partnership between human and robot.